She knows whereof she speaks. While serving in the Hawaii State House, she was stunned by the 9/11 attack and enlisted in the U.S Army. She was deployed to Iraq when that war began and learned firsthand of the cost of war, an experience that distinguishes her from her Presidential rivals. Tracking down terrorists is one thing, she says, but toppling autocrats we don’t like or trying to rebuild nations we don’t understand is another matter. In line with her thinking, she even met with Syrian President Bashar al-Assad under fire for his oppressive policies and the support of Russian President Putin. Other Democrats charged her with favoring Putin over President Obama on the question of Syria. But her action was consistent with her geopolitical outlook. Which makes more sense: trying to influence the Syrian dictator or overthrowing him without knowing what happens next? 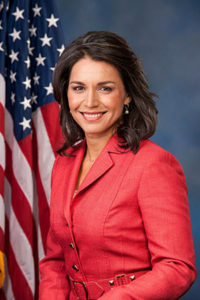 A supporter of Bernie Sanders in the 2016 election, Representative Gabbard has had to make some adjustments to accommodate the current domestic issues of the Democratic Party. On some social matters, from that point of view, she has lagged behind. But she was ahead of that other dissenting Congresswoman, Alexandria Ocasio-Cortez, in introducing a bill to eliminate fossil fuels by 2035. She also supports legalization of marijuana, which, among other things, might cripple the Mexican cartels responsible for most of the drug in the United States along with opiates. A Hindu and ardent surfer from the small Democratic state of Hawaii, Gabbard definitely qualifies for diversity. She is also part of a rising populist challenge to the status quo that’s occurring throughout the West. Though her nomination to oppose President Trump is a long shot, her combination of candor, fresh face and outlook could make her a formidable opponent.